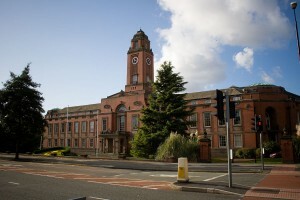 Stretford, located in the Trafford area of Greater Manchester, bordered by the River Mersey and the Manchester Ship Canal, is a town home to over 45,000 people. Home to mighty Manchester United football club and Lancashire cricket club, this is a town that loves its sports. Now, if like us you will know that with any love of sport comes a love of food. A fantastic combination. Personally, I see that there is no better way that to warm up after a cold day outside at the football than getting my hands around a huge freshly baked bread roll, piled high with slow roasted pork meat – and not holding back on the tasty condiments and toppings! One of my favorite facts about this Northern town is it’s very famous nickname all the way back in the 19th century. Historically known as an agricultural village, Stretford was once known as none other than Porkhampton! Due in reference to the large number of pigs the town produced for the famous and bustling Manchester market. Well, we can’t think of a better place than to continue this town’s love of pork with the Hog Roast Stretford catering team. Perhaps ever Porkhampton will make a comeback, and we would love to be the ones supplying some amazing pork this time! So, if you fancy experiencing some delicious food in Stretford (or should we say Porkhampton) yourself, get in touch with us here at Hog Roast Stretford. We are able to cater for events big and small, indoors and outdoors and for a range of different occasions including those super special days such as weddings, christenings and milestone birthday celebrations – not forgetting that we are able to cater for more formal and corporate business events too. Our wide range of menus are sure to have something suitable for your occasion and we are happy to accommodate a whole manor of your needs and requests to personally tailor the food for you. We are a versatile and knowledgeable team available to offer you spectacular hog roast food all year round right here in Stretford and the surrounding North West.